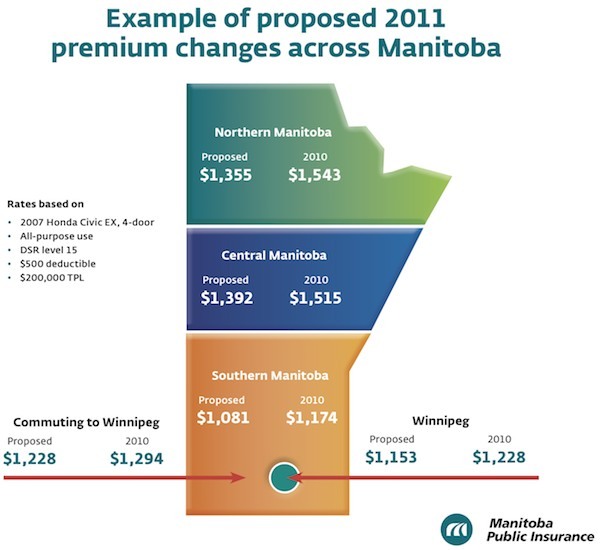 Manitoba motorists could see a rebate of about $115 per policy next spring if the general rate application set forth by Manitoba Public Insurance is approved by the Public Utilities Board. The public insurer announced the changes on Friday, which works out to be a 4 percent rate decrease, and a total of $92 million rebate to its policyholders. Enlarge the graphic to the left for an example premium breakdown. The 2011/12 rebate is the fifth in 11 years and is based on Basic Autopac rates for 2009/10. Some motorcycle drivers will need to pay more, however, as MPI said an increase of 1.02 percent would go forward if approved. But the majority of motorcyclists in Winnipeg and the surrounding area — about 4,200 in total — will see a decrease in their premium. MPI’s application also asked for additional drivers to be included under its Driver Safety Rating (DSR) discount. The discount rewards good drivers with lower premiums. About 673,300 vehicles are eligible for a decreased premium under the DSR.